The modern era of coinage begins with the introductin of the coin press machine that was used by Nicolas Briot as mintmaster in France to Louis XIII, and then later in England when he became mintmaster to Charles I. Coins and medals could be, for the first time, minted on regular planchets, and in higher relief. This era was also marked by the search for new sources of gold and silver by France, England, Spain, and Holland in North and South America, India, China, and Africa. This was the impetus for the era of Colonialization. Between 1800 and 1914, a period referred to as Britain's "imperial century" by some historians, around 10 million square miles of territory and roughly 400 million people were added to the British Empire. Until its dissolution in 1858, the British East India Company was key in the expansion of the British Empire in Asia. Though originally established to search for spices, the company found in India and China two of the cornerstones of the modern economy: Corporate exploitation of cheap indigenous labor, and the Drug Trade. They made Indian laborers grow opium and traded it for Tea in China. When the Chinese objected that their citizens were being turned into zombies, the British went to war to force them to accept the opium. Nevertheless, as exploitative as the British presence in the East may have been, like the Romans, they brought roads, building projects, schools, and relatively stable conditions for trade. As China, India and all of Asia rise, the new wealthy classes have become avid collectors of their numismatic heritage. The medals of the East India Company provide an amazing artistic testament to the intrepid characters who shaped this historic expansion and the battles they fought. As a note comparing the relative availability of British Indian medals to British Indian coinage: The original Strike William IV mohur mintage is reported by Spink at 29,000 pieces and by Baldwin's at 9000 pieces. In proof restrike it is estimated that there is at least that many again. The William IV 2 mohur original strike mintage is at about 2000 pieces, with the restrike estimates being twice that figure. Though undoubtedly many coins have been lost and melted over the years - so too with the medals. Before Robert Clive, for nearly 200 years the British East India Company was a trading firm dealing in spices and fabrics. It competed throughout the East with similar companies from France, Holland, Portugal, Spain, Denmark etc. as well as with various privateers. And it served at the caprice and whim of varying local Indian Princes. Clive changed all that. Through a series of dramatic military victories he seized control of the seas from the Dutch and Portuguese, ran the French out of Bengal and Calcutta, and then engineered a coup that overthrew the King of Bengal, and effectively claimed the entire region for the India Company, transforming the Company from a trading concern into a nascent Empire. He retired as one of the richest men in England - and the world. Quite an accomplishment for a man of humble origins who began his career as a clerk. Highly beautiful and very scarce in silver with desirable golden-gray patination and iridescent highlights. Robert Clive, Baron of Plassey, and the first Governor General of Bengal. 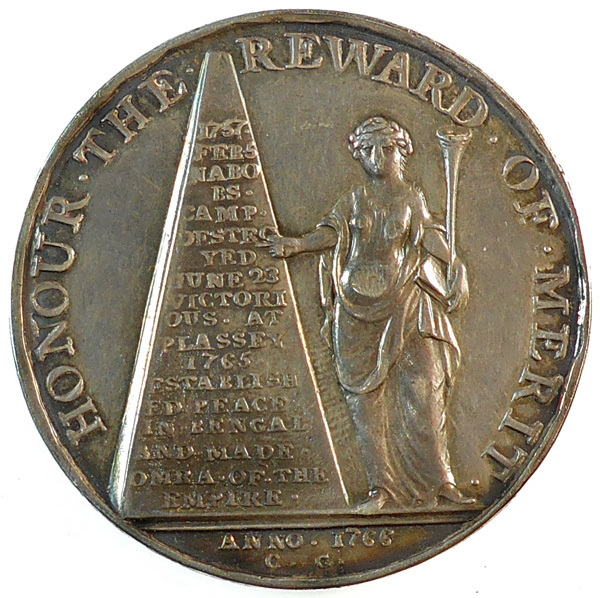 Silver Medal (42 mm, 26.7 gm) celebrating Clive's victories (both military and through brilliant political subterfuge) over Shah Alum which toppled the king and forced his successors into granting Bengal, Behar and Orissa permanently to Clive who "accepted the firman" on behalf of the British East India Company, thus, in effect - and in fact - founding the Empire of British India. Signed by John Van Noost and C Gosset (assisstant engravers at the Royal Mint). Obv: Lord Clive Robert Clive Baron of Plassey signed I.U.N.F Rev: Victory pointing at obelisk, inscribed: 1757 Nabobs camp destroyed. June 23 Victorious at Plassey. 1765 established peace in Bengal and made Omra (established the Imperial Authority) of the Empire Around: Honor the Reward of Merit, In exergue: Anno 1766 signed CG. Pudd, 766.1. RRR Extremely Rare, less than 25 specimens struck in silver according to Puddester. (none struck in gold) and of the highest historical significance. (BHM 363; Eimer 845; Pudd 792.1.2; R, Pollard 5) Scarce in Bronze. Rare, less than 50 known to Puddester Considered a medal, but struck to be used as currency at the Lucknow Bazaar, owned by Martin. ex David Fore collection. Medals of the Honourable East India Company are believed to have been struck over a period of time after the initial striking. In addition to the original strikes issued, there were also medals struck during the 'period', for late claims by military recipients who had lost or damaged medals. These are considered to be "contemporary" strikes, and can be difficult to destinguish from original strikes because of the very low mintages. Then there are those medals struck very much later, reputedly into the early 20th century, on demand for VIPs who needed examples for their collections. As the dies degraded in the humidity etc in India, over time they became rusty and would need to be polished before each batch of strikings to remove the surface corrosion (which still survived in the tiniest areas between details), gradually causing a loss of definition and resulting in more flaws and cracks to the die itself from repeated striking. The early strikes - especially those sharp strikes that appear to be original - carry a heavy premium over modern restrikes. Honourable East India Company Seringapatam Medal 1799, silver gilt, 48 mm. (49.3g) Original striking, British issue Soho mint version by C. Kuchler for Mathew Boulton. Sir Charles Wilkins from India House advised them on the medal’s design. Obv: The storming of the breach at Seringapatan. In Urdu: "The fort of Serengipatan, the gift of God, 4th May 1799" Rev: British Lion overcomes the Tiger of Sultan Tippu. Above, in Arabic:. "The Lion of God is the conqueror"
Believing that the Tippu Sahib, Maharajah of Mysore in southern India, was in negotiations with the French, and keen to eliminate the French influence in India, Governor General Lord Mornington (Richard Wellesley) ordered an army, in which all three Presidencies were represented, to be assembled under Lieutenant General G. Harris with orders to march on Seringapatam, capital of Mysore. Sultan Tippu was killed during the battle. Honorable East India Company Gold Egypt Medal 50mm, (53.6 g) Original or very early contemporary strike. (nearly impossible to tell with such a low mintage) Calcutta mint. Obv: Sepoy holding the Union Flag, Camp in the background. In Urdu: "This medal has been presented in commemoration of the defeat of the French army in Egypt by the victorious and brave English army." Rev: British Ship sailing towards the coast of Egypt, obelisk and pyramids in the background. MDCCCI in exergue. Settlement of British Bombay. -East Inida Company defeats French Silver Medal (41mm) engraved by JP Droz, G Mills and J Mudie. Reclining Neptune leaning against a globe and holding a Union Jack "Settlement of British at Bombay" In ex: MDCLXII signed Droz F. Mudie D./ Seated Neptune with Trident and Nike: "The French Fleat Repulsed by the E.I. Company XV Feb MDCCIV" Signed Mill F. Mudie D.
Gold Mathematics Prize (30.5gm.) by Thomas Wyon. Helmeted Head of Minerva with Elelphant motif on Corinthian Helmet, Cornucopia, rudder, caduceus in field. RV: Coll Anglo-India upper, Honoris Causa (for the sake of honor), lower In Discipl Mathm within wreath. Edge named (obscured by holder). 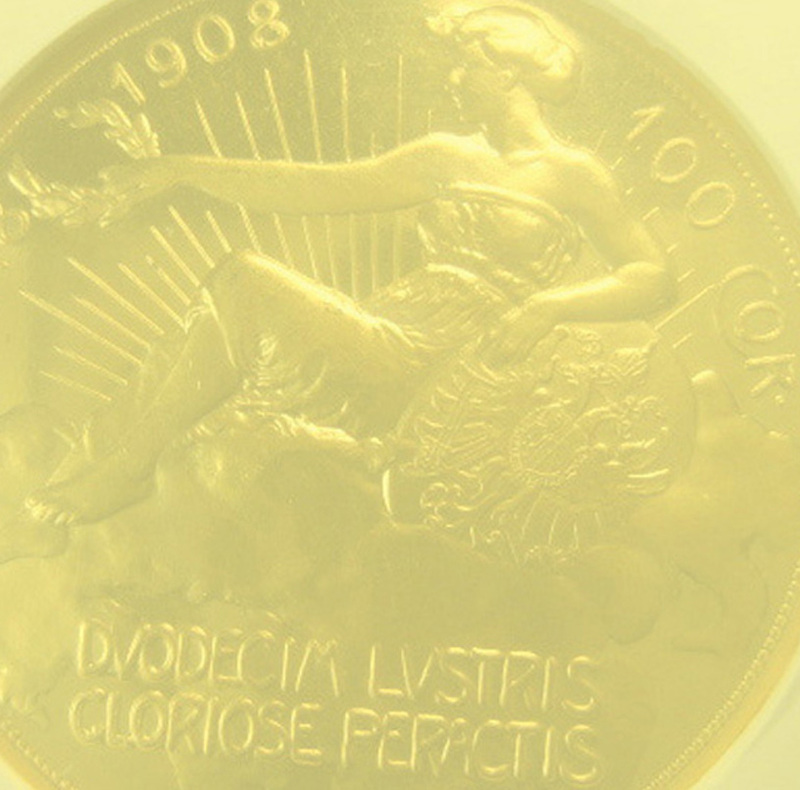 Pudd 941.3 RR Very rare in gold, less than 50 specimens minted, mostly business strikes. This is the only proof specimen recorded. Honourable East India Company Gold Medal for the Capture of Rodrigues, Isle of Bourbon & Isle of France 1809-10, (60.16g,) Original Strike Calcutta Mint, fitted with gold loop for suspension and contained in a contemporary red leather fitted case. Obv: a Sepoy holding British Flag and musket with bayonnet, Left Foot trampling a French Eagle and Standard. Reverse, in Urdu: This medal was conferred in the memory of the bravery and devotion exhibited by the Sepoys of the English Company in the capture of the Islands of Rodrigues, Bourbon and Mauritius in the year of the Hegira 1226 Around: Rodrigues VI July MDCCCIX, Bourbon VIII July, and Isle of France VIII December MDCCCX - (BBM 47, Chisholm-Britannica Vol 18 p7) Struck at the Calcutta mint for the Bengali Troops that fought in these battles. Soho mint. Signed Initial K for Conrad Heinrich Küchler. Sari draped female figure with elephant scalp writing and walking right, left altar, right flower / / Inscription in Sanskrit: BUDDHI PRASADJANTATA SUKHAM SATVIKAM PRITKAMATMA. In centre: SHRI VIDHYA VARAH: “Pursuit of Knowledge is Better than the Pursuit of Gold." Pudd. 948.1.2. Extremely Rare. Haileybury was extant for 52 years, suggesting a mintage if a Sanskrit gold medal was awarded each year, "though in practice few are found" according to Puddester. Mounted as a revolving brooch in a large gold frame, In an attractive vintage case. Allegorical scene of East-West Unity: mosque at left, pagoda at right (Muslim and Hindu India), sailing ship in centre background (Britain), under a rising sun. rev: legend in wreath ending june 30 mdcccxvi, (Pudd. 800.2). Extremely rare, less than 50 struck according to Puddester. Honorable East India Comapany Original Strike Silver Medal for Nepal (52.4 gm) Calcutta mint. Obv: Hills crowned with stockades, colors, bayonets and canon in the foreground. Rev in Urdu: "This medal was conferred by the Nawab General Governor (Marquis of Hastings) Bahadur, in testimony of the energy, good service, skill and intrepidity which were displayed in the hills in the year of the Hegira 1229 and 1230"
Warren Hastings was the first Governor-General to master Bengali and Urdu. He helped found the Bengali Asiatic Society, the Calcutta Madrasa and he commissioned the first English translation of the Bhagavad-Gita, for which he wrote the introduction. "British Victories" Marquis of Hastings (1754-1826), Governor-General of India (1813-1823), Victories in India, 41mm. (40.2gm.) 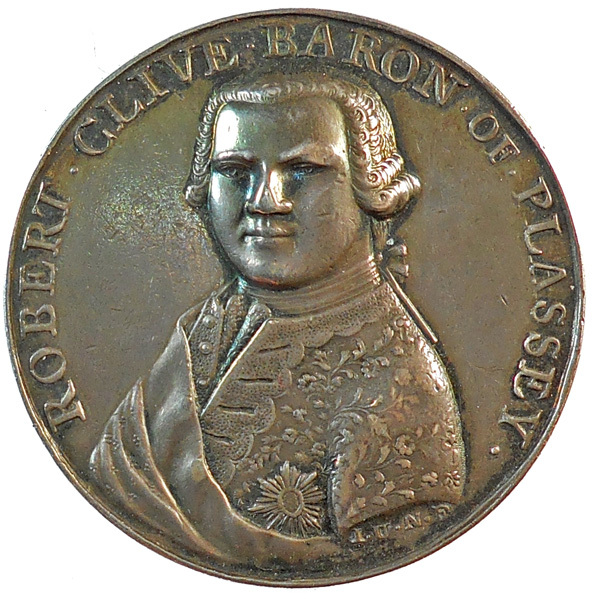 Silver Medal, 1818, Modelled by P. Rouw, engraved by W. Wyon, signed below truncation. Honorable East India Company Burma Gold Medal, (48.5gm) Magnificent original strike and fitted with original steel clip and split ring suspension. Designed by W. Daniell of the Royal Academy, and engraved by William Wyon at the Royal Mint.. Obv Signed by Wyon, rev signed by Daniell on the groundline. Obv: Storming of the Great Pagoda at Rangoon. Palm tree under which the general staff and the river carrying the Irwaddy Flotilla joining the attack. In Urdu: "The Standard of the victorious army of England upon Ava" Rev: Elephant of Burma crouching before the Lion of England, flags behind. 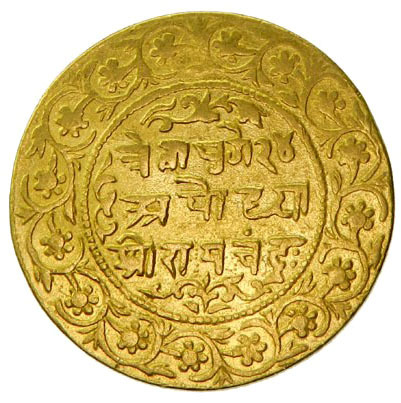 In Urdu; "The Elephant of Ava (Burma) submits to the Lion of England, year 1826"
Completion of the Bombay Mint. Large Silver Medal 64mm. (164 grams) Struck in 1828 - 2 years before the official opening of the mint. Obv: Lion walking before Palm Tree, Rev: GLORIOSISSIMO/REGNO GEORGII. IV./MONETARIVM BOMBAIÆ/DELINEATVM INCŒPTVM/ET PER ACTVM OPERA/STVDIOQUE.A.D 1828/J.HAWKINS.F.R.S within laurel wreath. Pudd.828, RRRR Used to illustrate the cover of the book. Excessively Rare - less than 12 struck according to Puddester, (none struck in any other metal) and of the highest historical and numismatic importance - being the pattern design for the mohurs and 2 mohurs of William IV struck later at the Calcutta mint in 1835, and thenceforth the symbol of British India. Extremely Rare - less than 50 struck according to Puddester. Presented, along with a copy of the "Pollock Memoir" to the outstanding cadet of the year. Ex Magnus collection. Bombay Exhibition, Silver Medal, 1873, bust of Victoria left, rev legend in wreath, 39mm. Signed by Benjamin Wyon under the bust. Extremely Rare, less than 50 struck in silver according to Puddester. The Delhi Durbar ceremonies of Victoria, Edward and George were the Crowning Events of turn of the century British Empire, celebrating the British Monarch's coronation as Emperor of India. Victoria's Durbar was an official event marking the transfer of control of India from the East India Company to the British Crown. It was attended mostly by British Officers and Indian Royalty. The two subsequent Durbars were popular celebrations lasting weeks on end, comprised of exhibitions of Art, Culture and Sporting Events, fantastic processions and pageantry, all culminating in magnificent Coronation Ceremonies. The Gold medals awarded at the Coronation Ceremonies are extremely rare and beautiful artifacts attesting to the last gasp of British World Dominance. Similar to Mitchiner-389, which is in copper. This example is struck in gold. Extremely Rare in gold. Crowned draped head of Victoria, around border: Victoria 1st January 1877, signed GG Adams SC. Rev: Empress of India in Urdu, English, and Devangari. Edward VII, Delhi Durbar, official gold medal (54.6 gms) to celebrate the coronation of Edward VII as Emperor of India. Bust of King Edward rt, with laurel spray beneath: EDWARD VII DELHI DARBAR around. Very Rare: 140 medals minted in gold and awarded to the King's party and the rulers of the Indian Princely States. George V, Delhi Durbar, official gold medal (41.5gms) to celebrate the coronation of George V as Emperor of India - Calcutta mint. Conjoined busts of George and Queen Mary l., rev. date in circle of Farsi script: THE DURBAR OF GEORGE V, EMPEROR OF INDIA, KING OF ENGLAND, with ring for suspension and ribbon. At the actual Durbar the medal in gold was awarded to the Viceroy and 27 other senior British officials. The Prime Minister of Nepal and the Aga Khan also received medals whilst a further 114 were presented to Indian Princely rulers. Very Rare. Only 200 specimens struck in gold according to Pudd, though Spink has recently revised the number to 118 (Pudd 911.2.1; MYB.312), ex Spink, provenance of Sir Charles Stuart Bayley, G.C.I.E., K.C.S.I., I.S.O. 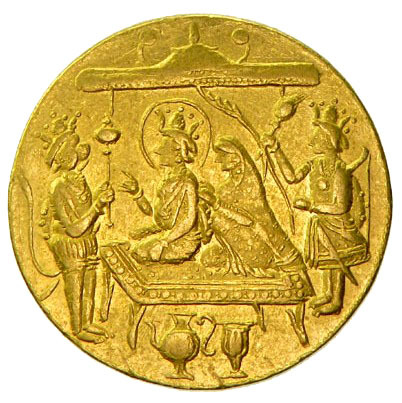 (Royal Indian Orders), and Lieutenant-Governor of Orrissa, Bihar and (at the time of the Durbar) Eastern Bengal and Attam - and as such was the Seventh Dignitary presented to receive this medal. George V: Royal visit of King George and Queen Mary to India1911-12, Monogram Gold Medal (10.6 grm). GRI (George King Emperor) Entwined initials with crown above, Below: India, MRI (Mary Queen Empress) below: 1911-1912. Believed by Puddester to be a presentation piece on the Royal Tour following the Durbar.